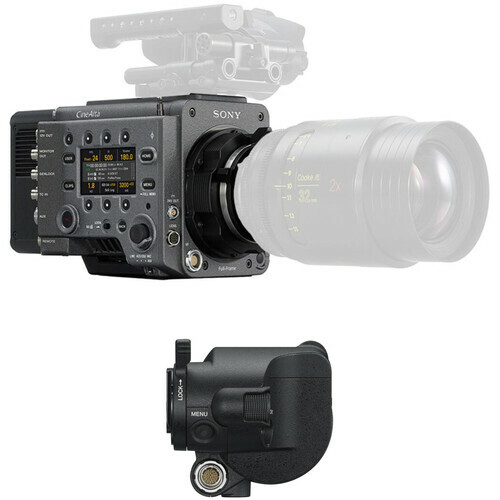 Providing a basic camera body with EVF, the Sony VENICE 6K Lite Digital Motion Picture Camera Package can be thought of as an introductory shooting package that can grow as you need it to. The camera body features a full-frame sensor with 15+ stops of dynamic range; however, in this configuration it can only use a Super 35 crop for a cinematic feel to your images. To achieve full-frame cinematography it requires an available, but not included, full-frame upgrade license. Likewise, to take advantage of the camera's anamorphic capabilities it also requires an optional anamorphic license. You can record files as XAVC or ProRes in DCI or UHD 4K, as well as HD, internally to available SxS cards. Raw file capture can be accomplished with optional external recorders such as the AXS-R7. The included EVF features a 0.7" OLED panel with 1920 x 1080 resolution and 200 cd/m2 brightness. A built-in diopter ring enables adjusting the EVF to suit most eyes. The built-in eye sensor controls the anti-burn-in function of the OLED. Providing a flexible design configuration within a single camera body, the Sony VENICE 6K Digital Motion Picture Camera is meant to provide you with just the amount of camera you need, so you don't have to invest in more than necessary. It features a full-frame CMOS sensor with 15+ stops of dynamic range, but in its basic configuration it windows the sensor to shoot Super 35. The camera comes with a removable PL Mount that supports the Cooke /i Technology lens metadata protocols, allowing you to work with cinema-style glass ranging from vintage to modern. As is, the camera supports DCI and UHD 4K capture, while planned and scheduled firmware updates will enable anamorphic, full-frame, and select frame rates from 1 to 60 fps. Remove the PL Mount to reveal a Sony E-Mount with a locking outer ring that allows you to mount your lens and then rotate the ring to secure it, creating a strong mounting system that does not require you to rotate your E-Mount lens when mounting it to the camera. Eight integrated and motorized ND filters range from clear to seven stops of ND in one-stop increments. The camera features a built-in assistant-side info screen, along with a smaller basic info display screen on the operator side or the camera. It features dual SxS card slots that allow you to capture XAVC or HD ProRes in-camera. The VENICE is designed to start you off with a basic camera and, through firmware updates and licenses, upgrade it over time. This allows you to upgrade it as your needs grow, instead of having to buy a whole new camera system. Licenses can be permanent upgrades or used for limited periods of time, for those jobs that require more features than you normally use. The sensor features more than 15 stops of dynamic range and has been designed to exceed the BT.2020 color space—which is larger than the DCI-P3 color space—enabling you to create stunning images with a camera that already exceeds future specs. In full-frame, you can use the full 6048-pixel width of the sensor for widescreen spherical 2.39:1, or large format scope. A firmware upgrade and license are required for full-frame recording. The VENICE features a high-speed readout that minimizes the dreaded "jello" camera effect that plagues some CMOS sensor cameras. The VENICE comes with the industry-standard PL lens mount. It is compatible with all Super 35 and full-frame PL lenses, spherical and anamorphic. The removable lens mount includes contacts that support Cooke /i Technology. The camera's lens information is recorded as metadata frame by frame. Removing the PL Mount exposes the camera's E-Mount, which allows compatibility with E-Mount lenses. This E-Mount is designed with a lever lock that eliminates the need to rotate your lens when mounting, and the lever lock secures the lens in the mount minimizing play. Rotating of the locking collar means that in most cases lens support rigs don't need to be removed, which saves time during production. A planned firmware update is required to take full advantage of the E-Mount. The VENICE records XAVC UHD 4K or HD ProRes internally to its SxS card slots. An optional AXS-R7 on-board recorder will enable 16-bit Raw and X-OCN recording to AXS cards with a future firmware update. The DVF-EL200 Full HD OLED Viewfinder from Sony is for use with the PMW-F55/F5 and VENICE 6K motion picture cameras. The viewfinder features a 0.7" OLED panel with 1920 x 1080 resolution and 200 cd/m2 brightness. A built-in diopter ring enables adjusting the EVF to suit most eyes. The built-in eye sensor controls the anti-burn-in function of the OLED. In addition to the improved OLED panel, the DVF-EL200 features more durability and usability with an eye distance measure sensor, rotary encoders for controlling brightness, and contrast. It also features a LEMO-type connector and quick release system to detach the viewfinder from the camera. Compatible with CineAlta cameras, including the PMW-F5, PMW-F55, and VENICE. The viewfinder is dust and splash resistant, making it suitable for use in location shooting as well as in studio. The viewfinder features a rotary encoder and menu button. These allow you to quickly access and control brightness, contrast, and peaking without having to open the main camera menu display. The DVF-EL200 will automatically invert its OLED display when its proximity sensor detects your eye has moved away. The proximity sensor has improved responsiveness compared to the DVF-EL100. Box Dimensions (LxWxH) 13.7 x 11.14 x 9.7"
Box Dimensions (LxWxH) 9.8 x 7.4 x 6.8"